Justin Timberlake (born January 31, 1981 in Memphis, Tennessee) is a Grammy Award winning singer, actor, producer and dancer. Eventim is the place to look for Justin Timberlake tickets and tour dates. 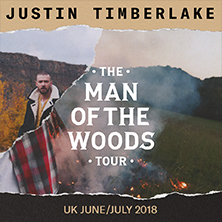 To be the first to hear when more Justin Timberlake tickets go on sale you can sign up to the Eventim Ticket Alarm below. Justin Randall Timberlake (born January 31, 1981 in Memphis, Tennessee) is a Grammy Award winning singer, actor, producer and dancer. He rose to fame as one of the front men of the hugely successful pop group *NSYNC. He released his debut solo album, Justified, in 2002 and it went on to sell over nine million copies worldwide, solidifying Timberlake’s position as a pop superstar. Timberlake’s second album, FutureSex/LoveSounds, was released in 2006 and featured numerous hit singles including My Love featuring T.I. and SexyBack featuring Timbaland. Timberlake’s first two albums made him one of the most commercially successful singers in the world, each selling in excess of 9 million copies (in addition to his 55 million albums sold with *NSYNC). Aside from music, he has also begun an acting career, while his other ventures include record label Tennman Records, fashion label William Rast, and the restaurants Destino and Southern Hospitality. Justin Randall Timberlake was born to Lynn Harless and Randy Timberlake on January 31, 1981 in Memphis, Tennessee. In 1992 at the age of 11, he appeared on the show “Star Search”, and even though he didn’t win, it didn’t dampen his ambitions. He later appeared on “The Mickey Mouse Club”, where his costars included Britney Spears, Ryan Gosling, Corey Franks , Keri Russell, Christina Aguilera and fellow *NSYNC band mate, JC Chasez. At the age of 14, Justin became a member of the boy band, *NSYNC and in 1998, the group released their self-titled debut album. They became a huge hit with fans and made a place for themselves in the music world with a succession of top-selling albums. In the beginning of 2002, Justin spent time working on and writing songs for his debut solo album. The release of the solo album, titled “Justified”, came in November of 2002. Songs from his solo album include: “Like I Love You”, “Cry Me A River”, “Rock Your Body” and “Señorita.” He won two Grammy Awards in 2004: “Best Pop Vocal Album” and “Best Male Pop Vocal Performance” (Cry Me A River). In 2007, Timberlake won two Grammy Awards for songs on his FutureSex/LoveSounds album: “Best Rap/Sung Collaboration Rap” (My Love (with T.I.)) and “Best Dance Recording Dance” (SexyBack).